Australia is drifting north, necessitating a change in its coordinate system. Time to update your maps—Australia’s moving. 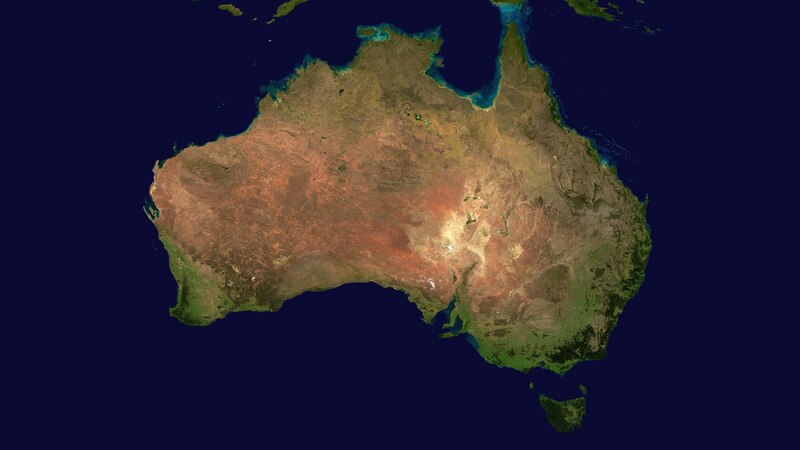 Since 1994, when the country last updated its coordinates, Australia has drifted 1.5 meters north (about 5 feet). In an effort to stay ahead of the Earth’s tectonic plates, the country is moving itself 1.8 meters north (about 6 feet). The shift will future proof the continent as it prepares for more autonomous vehicles, from farm tractors to cars. “If you want to start using driverless cars, accurate map information is fundamental,” said [project head Dan] Jaksa. Australia, like most regions, has its own coordinate system, also known as a geodetic datum. There are the several global coordinate systems that are perfectly serviceable, but local versions do a better job at minimizing the distortion occurs when transferring the true shape of the Earth onto a flat coordinate plane. Because the Earth isn’t a perfect sphere, no datum is perfect. But by limiting the amount of the Earth’s surface that needs to be pulled and stretched when flattened, datums that cover smaller areas can more closely approximate the real thing. Australia’s new datum is expected to align with reality sometime in 2020. 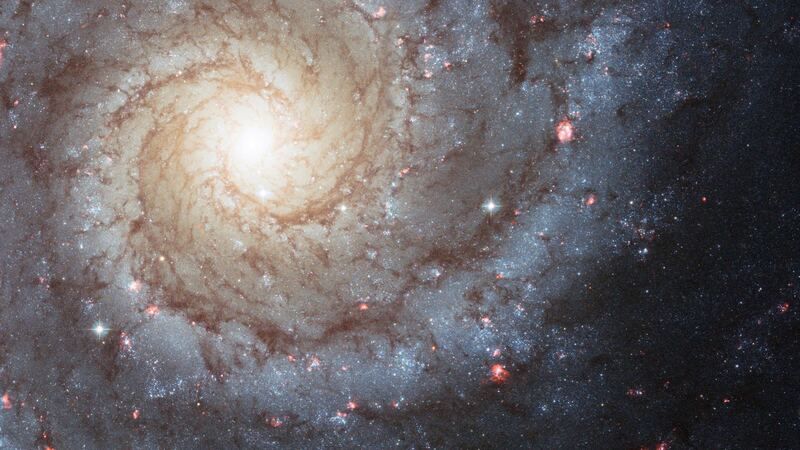 If life is rare in our universe, it might be more common in alternate ones. According to scientists, life is possible because a triad of alpha particles unite to fuse into carbon. But there are some problems with that theory—fusing two alpha particles leads to a very unstable isotope (beryllium-8), which makes the abundance of carbon in the universe seem odd and improbable. In the 1950s, astronomer Fred Hoyle suggested that to resolve this problem, the fusion of three alpha particles must create carbon-12 with more energy than it needs. This “resonance” between the collective alpha particle energies and the excited state of carbon-12, which later decays to a ground state, is very sensitive—if you change it just slightly, the creation of carbon isn’t possible. Some experts insist that this fact is evidence of the multiverse’s existence: since the chances of this critical value arising are so low, other universes with other such fundamental constants must exist, too. Only those universes that are appropriately fined-tuned would give birth to life. 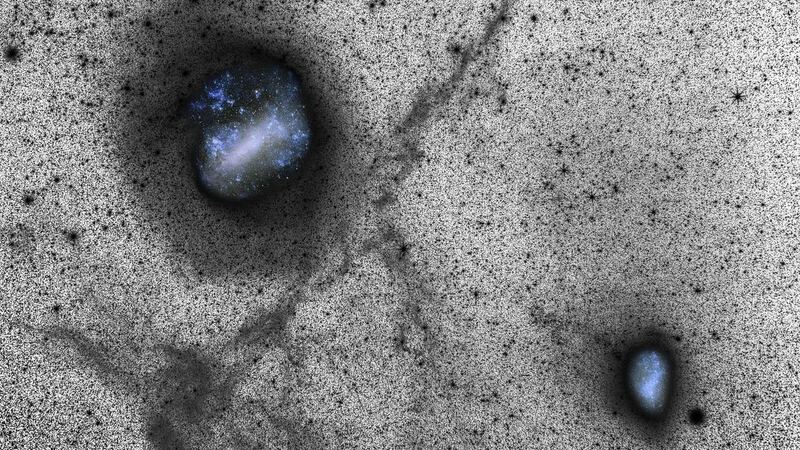 Now, cosmologists are taking this idea to the next level. “But now Adams and his colleague Evan Grohs have argued that if other universes have different fundamental constants anyway, it’s possible to create a universe in which beryllium-8 is stable, thus making it easy to form carbon and the heavier elements. For this to happen would require a change in the binding energy of beryllium-8 of less than 0.1 MeV – something that the pair’s calculations show should be possible by slightly altering the strength of the strong force, which is responsible for holding nuclei together. In April 2011, Christopher Barker, a radiation oncologist at Memorial Sloan Kettering Cancer Center in New York, received some unusual news about a participant in a clinical trial. The patient was battling a second recurrence of melanoma that had spread to several areas of her body. After more than a year on the experimental drug, her tumors had only gotten bigger, and after one near her spine started causing back pain, her doctors arranged for local radiation therapy to shrink the tumor and give her some relief. But the tumor near her spine was not the only one that shrank. “From one set of images to another, the radiologist noticed that there was a dramatic change in the extent of the melanoma,” Barker says. Although only one tumor was exposed to radiation, two others had started shrinking, too. 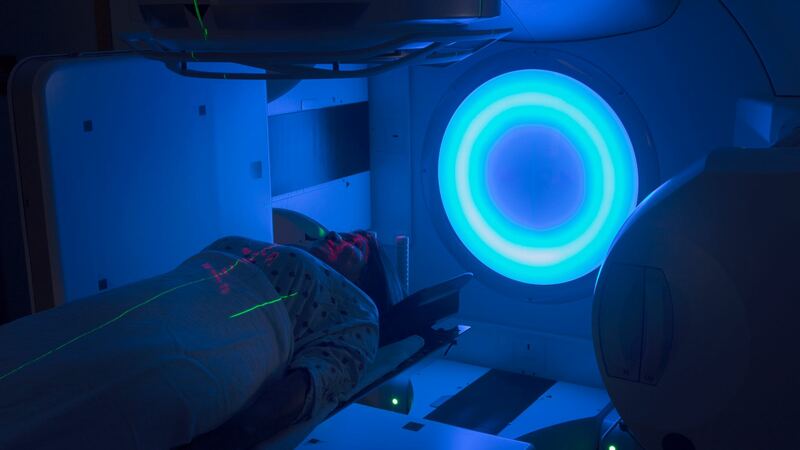 A woman prepares to receive radiation treatment for cancer. Photo credit: Mark Kostich/iStockphoto. Although the abscopal response was first recognized back in 1953, and a smattering of case reports similar to Barker’s appeared in the literature throughout the 1960s, ’70s, and ’80s, the mystery behind the abscopal response largely went unsolved until a medical student named Silvia Formenti dusted it off. The primary goal of therapy with ionizing radiation—the type used to shrink tumors—is to damage the DNA of fast-growing cancer cells so they self-destruct. But like burns, radiation also causes inflammation, a sign of the immune system preparing for action. For a long time, it was unclear what effect inflammation might have on the success of radiation therapy, though there were some hints buried in the scientific literature. For example, a 1979 study showed that mice lacking immune cells called T cells had poorer responses to radiation therapy than normal mice. But exactly what those T cells had to do with radiation therapy was anyone’s guess. In 2001, shortly after arriving in New York, Formenti attended a talk by Sandra Demaria, a pathologist also at Weill Cornell. Demaria was studying slivers of breast tumors removed from patients who had received chemotherapy and had found that in some patients, chemotherapy caused immune cells to flood the tumors. This made Formenti wonder if the same thing could happen after radiation therapy. In addition to fighting off illness-causing pathogens, part of the immune system’s job is to keep tabs on cells that could become cancerous. For example, cytotoxic T cells kill off any cells that display signs of cancer-related mutations. Cancer cells become troublesome when they find ways to hide these signs or release proteins that dull T cells’ senses. “Cancer is really a failure of the immune system to reject [cancer-forming] cells,” Formenti says. Formenti and Demaria, a fellow Italian native, quickly joined forces to determine whether the immune system was driving the abscopal response. To test their idea, their team injected breast cancer cells into mice at two separate locations, causing individual tumors to grow on either side of the animals’ bodies. Then they irradiated just one of the tumors on each mouse. Radiation alone prevented the primary tumor from growing, but didn’t do much else. Yet when the researchers also injected a protein called GM-CSF into the mice, the size of the second tumor was also controlled. GM-CSF expands the numbers of dendritic cells, which act as T cells’ commanding officers, providing instructions about where to attack. But the attack couldn’t happen unless one of the tumors was irradiated. “Somehow radiation inflames the tumor and makes it interesting to the immune system,” Formenti says. Formenti and Demaria knew that if their findings held up in human studies, then it could be possible to harness the abscopal effect to treat cancer that has metastasized throughout the body. When Demaria and Formenti first published their results in 2004, the concept of using radiation to activate immunity was a hard sell. At the time, research into how radiation affected the immune system focused on using high doses of whole-body irradiation to knock out the immune systems of animal models. It was counterintuitive to think the same treatment used locally could activate immunity throughout the body. That perspective, however, would soon change. In 2003 and 2004, James Hodge, an immunologist at the National Cancer Institute and his colleagues published two mouse studies showing that after radiation, tumor cells displayed higher levels of proteins that attract and activate cancer-killing T cells. It was clear radiation doesn’t just kill cancer cells, it can also make those that don’t die more attractive to immune attack, Hodge says. This idea received another boost in 2007 when a research team from Gustave Roussy Institute of Oncology near Paris reported that damage from radiation caused mouse and human cancer cells to release a protein that activates dendritic cells called HMGB1. They additionally found that women with breast cancer who also carried a mutation preventing their dendritic cells from sensing HMGB1 were more likely to have metastases in the two years following radiotherapy. In addition to making tumors more attractive to the immune system, Hodge says, the damage caused by radiation also releases bits of cancer cells called antigens, which then prime immune cells against the cancer, much like a vaccine. In some ways, Barker says, oncologists have always sensed that radiation works hand-in-hand with the immune system. For example, when his patients ask him where their tumors go after they’ve been irradiated, he tells them that immune cells mop up the dead cell debris. “The immune system acts like the garbage man,” he says. Formenti and Demaria had already shown in mice that such assistance could come in the form of immunotherapy with GM-CSF, and in 2003 they set out to test their theory in patients. They treated 26 metastatic cancer patients who were undergoing radiation treatment with GM-CSF. The researchers then used CT scans to track the sizes of non-irradiated tumors over time. Last June, they reported that the treatment generated abscopal responses in 20% of the patients. Patients with abscopal responses tended to survive longer, though none of the patients were completely cured. As the Weill Cornell team was conducting their GM-CSF study, a new generation of immunotherapeutic drugs arrived on the scene. Some, like imiquimod, activate dendritic cells in a more targeted way than GM-CSF does. Another group, the checkpoint inhibitors, release the brakes on the immune system and T cells in particular, freeing the T cells to attack tumors. In 2005, Formenti and her team found that a particular checkpoint inhibitor worked better with radiotherapy than alone and later reported that the same combination produces abscopal responses in a mouse model of breast cancer. The availability of checkpoint inhibitors seems to have opened the floodgates. Since the US Food and Drug Administration approved ipilimumab in 2011, there have been at least seven reports of suspected or confirmed abscopal responses in patients on checkpoint inhibitors, including the one Barker witnessed. Contrast that with the previous three decades, where less than one per year was reported, according to one review. Almost all of the recent cases involving checkpoint inhibitors have been in patients with melanoma, since that’s where the drugs have mainly been tested. But, abscopal responses with or without immunotherapy have been reported in patients with cancers of the liver, kidney, blood, and lung. There are now dozens of clinical trials combining radiation with a range of immunotherapies, including cancer vaccines and oncolytic viruses. “There’s quite a nice critical mass of people working on this,” Formenti says. She and Demaria are now finishing up a clinical trial in lung cancer patients using a protocol similar to the one that worked so well in their original patient. “I think we know that people who respond to checkpoint inhibitors already have more immune-activating tumors,” Demaria says. The question now, she says, is whether radiation can expand the 20% of people who respond to the combination therapy. One solution might be to match combinations to particular patients or tumor types. Demaria’s team is collecting blood and tissue samples from patients in a Weill Cornell lung cancer trial to look for differences in the immune responses of those who do and don’t generate abscopal responses. Such changes in the number or status of a cell type associated with particular outcomes are known as biomarkers. So far, there is little data about how the two types of responses differ. Barker and his team did publish measurements of a broad range of immune markers from their patient who experienced an abscopal response. “We didn’t really have a lot of clues in terms of what we should look at,” he says. They observed a bump in activated T cells and antibodies specific to tumor proteins following radiation, followed by steady declines of both as the tumors regressed. But, he says, there was no “smoking gun” that could explain why this particular patient responded the way she did. Demaria says her research suggests that more tumor damage is not always better and that high radiation doses may be counterproductive, activating feedback responses that suppress immunity. She’s currently comparing immune signatures of different radiation regimens in mice. So far she says regimens that make the cancer look and act like virally-infected cells tend to elicit the best immune responses, but there is a long way to go in translating that work into humans. “Things are moving faster than they have for a long time, but at this point there are still a lot of unanswered questions,” she says. The difference between Lithium-6 and Lithium-7 might not seem like much, but it is poking holes in our understanding of how atoms formed during the Big Bang. Technically, they’re off by a single neutron: 6Li contains three neutron and 7Li contains four. Compared to theoretical calculations, experiments show that the universe contains way too much 6Li and too little 7Li. Using basic principles of physics, scientists can compute how much of each type of lithium should have been created during the Big Bang. But, the theory doesn’t match the data—each time they look to the sky, physicists observe a different balance of lithium than expected. Scientists have good reason to believe their calculations are correct. They accurately predict the observed quantities of many other elements with startling accuracy. 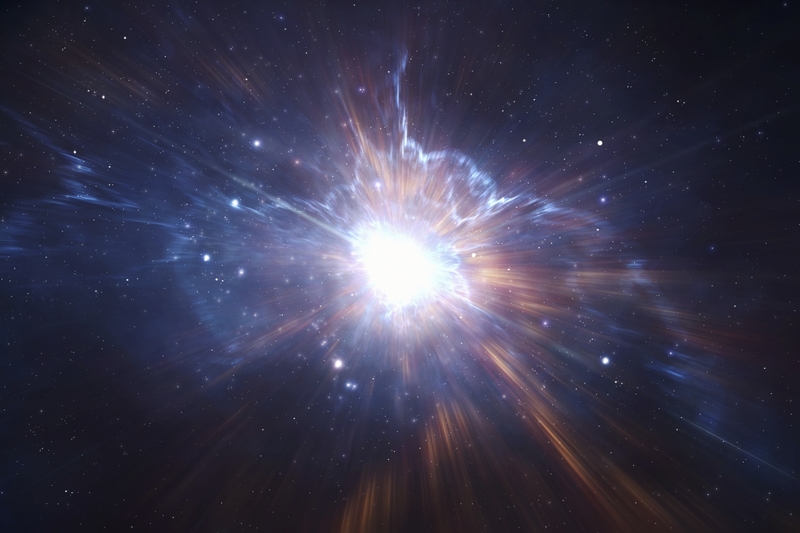 A recent experiment published in Physical Review Letters tried to replicate the conditions of the Big Bang to prove that more lithium was produced than scientists originally calculated. The lithium would come from a fusion of a tritium atom and helium ion, which could only be replicated with a giant laser. But the experiment didn’t produce enough 6Li to account for all that’s observed—that is, the new results support the existing perplexing calculations. The disconnect between theoretical and experimental values of lithium in the universe cannot be explained, and that’s a big problem for our understanding of basic physics. Fortunately, there’s one possible explanation for the discrepancy that hasn’t been ruled out yet—lithium is created and destroyed inside stars. It’s possible that scientists accurately predicted how much 6Li was produced during the Big Bang, and the rest was created later in stars. But for now, lithium is challenging our understanding of the Big Bang, big time. On October 5, 2015, the world watched in horror as Islamic State forces blew up the iconic 2,000 year-old Arch of Triumph in the ancient city of Palmyra, Syria. This carefully orchestrated act was the climax of a 10-month rampage of destruction and mass executions perpetrated by ISIS at the UNESCO World Heritage site. With Palmyra secured and a fragile Syrian truce in place, some news stories have given the impression that the worst wave of heritage destruction is over. The Arch of Triumph in Palmyra as seen on January 15, 2013. In fact, satellite photography is revealing a shocking picture of the ongoing, systematic destruction of churches, mosques, antiquities, and museums throughout Syria and parts of Iraq and threats to heritage sites elsewhere in the Middle East. 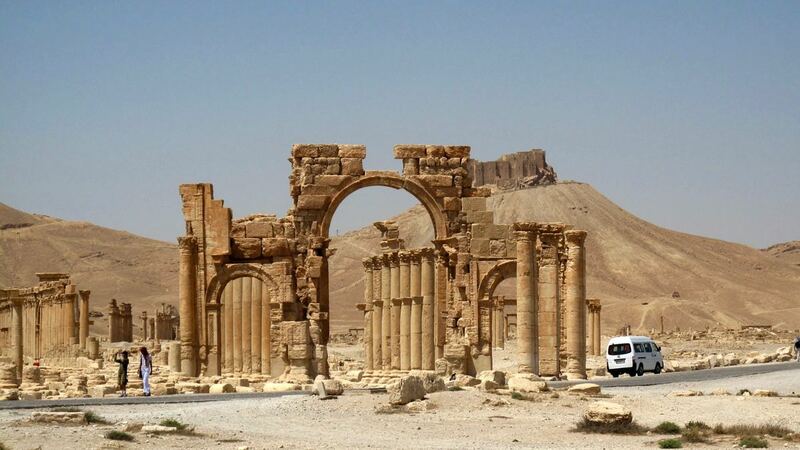 But that hasn’t stopped courageous local archaeologists and citizens from risking their lives to combat the devastation, aided by specialists outside the war zone who are deploying satellite and 3D imaging to help monitor, record, and replicate ancient sites. A digital reconstruction of the Arch of Triumph. Danti leads a team that publishes a weekly report documenting attacks on sites in Syria and northern Iraq. Known as ASOR Heritage Cultural Initiatives and funded by the U.S. State Department, the team draws on a wide range of images, from Cold War-era CORONA spy photos to constantly updated, high-resolution coverage provided by the commercial satellite operator DigitalGlobe. Since the full extent of damage to ancient sites is not always visible from space, ASOR’s bulletins are also based on a network of over fifty on-the-ground informants, including local citizens, refugees, Syrian archaeologists, and NGO workers. Some informants report from inside ISIS-controlled areas at great personal risk. (Danti lived in Raqqa, the ISIS “capital,” for 20 years, and many of his contacts spring from personal connections made during that time.) Social media from inside Syria and Iraq is another rich source of tips for the ASOR team; sometimes, they get to know about acts of destruction before ISIS can publicize them. In its first year of operation, ASOR recorded 722 heritage attacks in Syria and 90 in Iraq. During that period, ISIS grabbed global headlines with its flagrant acts of demolition at World Heritage sites including the blowing up of Palmyra’s Temple of Bel, the smashing of sculptures in the Mosul Museum, and the destruction of the Assyrian city of Nimrud with sledgehammers, power tools, and finally explosives. But the satellite images reveal a huge increase in less conspicuous acts of destruction: looters’ pits that are visible from space as pockmarks disfiguring sites across the region. ASOR’s analysis shows that in the first four years of the Syrian conflict, more than 3,000 sites have been looted, nearly an order of magnitude increase over the pre-war period. The evidence implicates all parties in the Syrian war, including Assad’s military, but the most intensively ransacked sites are clearly the handiwork of ISIS. 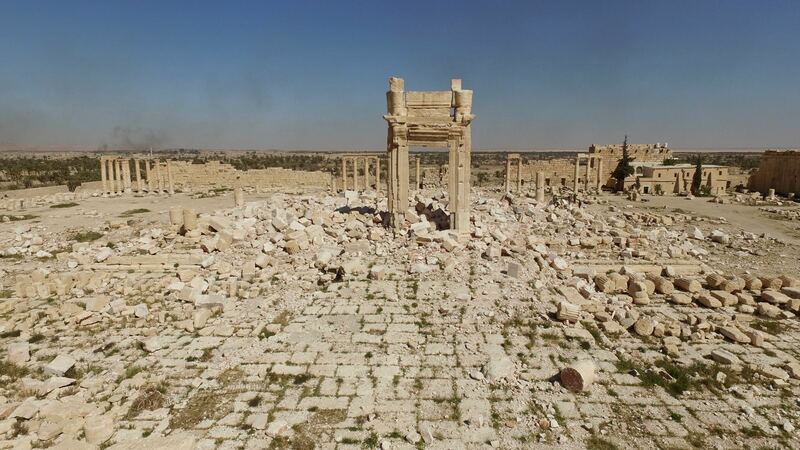 “Cultural heritage always suffers during conflict,” Danti says, “but what’s new is that ISIS has turned cultural destruction into a systematic business.” For instance, ISIS issues “dig” permits and hires contractors to bulldoze sites, while charging 20% sales tax on looted items. The entrance to the Temple of Bel is all that remains standing of the ancient building after ISIS forces brought down the rest. Beyond the illegal antiquities trade, ISIS engages in “cultural cleansing,” destroying historic and modern churches and mosques to demoralize the Shia, Christian, Yezzidi, and other minorities that their ideology brands as “apostate.” Space imagery has again proven crucial in tracking the destruction. Such images have helped a team of Czech scholars to assess the impact of a demolition campaign targeting sacred structures in Mosul following the city’s capture by ISIS in June 2014. “Mosul was a crossroads of culture and peaceful co-existence during medieval times,” says Karl Novacek, an archaeologist at the University of Olomouc in Moravia. “Many different ethnic traditions gave rise to a unique style of sacred architecture that’s barely been studied.” The space images show that 38 monuments—mostly early Islamic mosques—have either been reduced to ruins or completely razed and turned into car parks. The images are part of a database in which the team is assembling all the records, archives, and photos they can find of the lost monuments, many of them scattered among scholars and the collections of local people. “If we succeed, we could create a base for future architectural restoration,” Novacek says. Besides tracking what’s been lost, digital technology opens up new possibilities for a post-war future that’s faced with the challenge of restoring iconic structures. The Syrian government’s Directorate-General of Antiquities and Museums is already collaborating with ICONEM, a Paris-based architecture firm, to produce “before” and “after” 3D models that anyone can access to zoom in and study wrecked sites in extraordinary, stone-by-stone detail. For example, Krak des Chevaliers, one of Syria’s best known 11th century Crusader castles, was severely damaged when government forces finally drove rebels from the hilltop in 2014. ICONEM programmers designed a “bot” to roam the web and harvest thousands of pre-war photos of the castle, which they then assembled and used to generate a “point cloud” representing a partial 3D model of the Castle. They can superimpose a layer showing recent damage on top of the pre-war model. This may well provide an indispensable visual guide for any eventual attempt to restore the site. Tour through ICONEM’s digital reconstruction of Krak des Chevaliers. 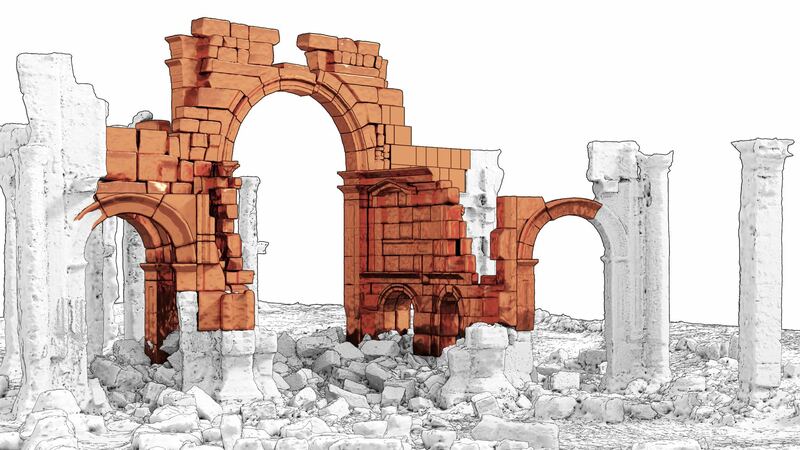 The potential of 3D printing to replicate sites generated worldwide headlines in April, when a two-thirds scale model of Palmyra’s Arch of Triumph was erected in London’s Trafalgar Square; the Arch may travel to New York in the Fall. The model was, again, recreated from pre-war photos and was programmed to drive a massive stonecutting machine at a quarry at Carrara in northern Italy, next door to where Michelangelo obtained marble for his statue of David. ICONEM used pre-war photographs to build a 3D model of the Temple of Bel. Can Replicas Replace What’s Lost? 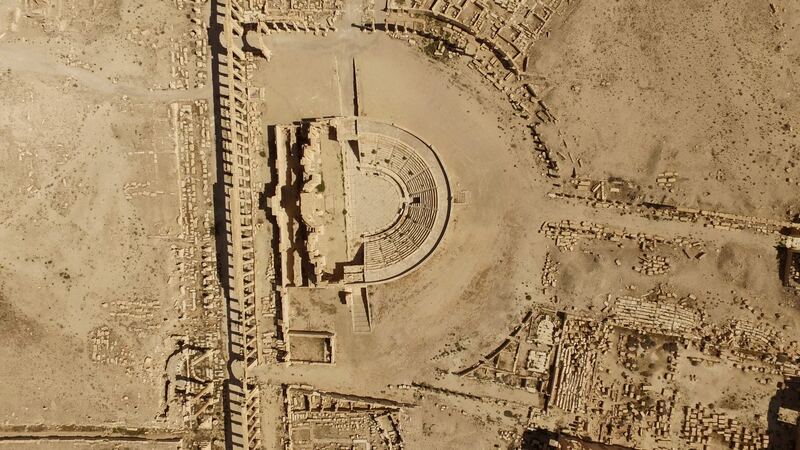 A satellite image of Palmyra’s amphitheater. Meanwhile, ISIS and other extremist groups still pose a dire threat to the Middle East’s ancient cultural treasures. Among the most serious current threats outside Syria, Libya poses the gravest concern. As a shaky coalition government is still taking shape, ISIS forces are converging on coastal Greco-Roman cities such as Cyrene and Leptis Magna that are scarcely less imposing or extensive than Palmyra itself. Meanwhile, in Egypt, security at ancient sites is unraveling. Space archaeologist Sarah Parcak, who used satellite imagery to detect a possible new Norse site in Newfoundland in NOVA’s recent show “Vikings Unearthed“, recently applied the same techniques to study the looting of ancient Egyptian sites. She has documented a 50% jump in looting at four major sites since the 2011 revolution. With all the human suffering of the Syrian war and the refugee crisis, why should we care about endangered heritage? Michael Danti stresses that the issue goes far beyond the concerns of archaeologists. “ISIS is practicing cultural terrorism,” he says, “as they target and eliminate the identity of entire sections of society in a way that’s directly comparable with Nazi atrocities.” By supporting the efforts of local heritage workers to protect and reclaim sites, scientists can help embattled communities hang on to hope and a sense of community in a time of terror. As a Harvard undergraduate, Sarah Demers—now a professor at Yale University—didn’t have the job you would imagine of a young student of particle physics. She wasn’t running code, writing equations on whiteboards, or trawling data for statistically significant signals. Instead, she was sitting in a basement, transforming 10,000 sheets of gold-coated Mylar into an instrument that would go inside the Fermilab particle accelerator. It was menial, tedious labor, and she was the only woman in the windowless room. Even after the transformation was complete, the work and the instrument itself didn’t scream “glamorous.” In its DIY, basement-built glory, the detector looked less like a sophisticated science instrument and more like someone toppled over a set of cheap garage shelves. Before the job started, she thought she would hate it, and—worse—that she wouldn’t understand the underlying physics, that she was just messing around with foil sheets. But she found that she did understand, and soon she could comprehend not only how the strange instrument worked, but also how it would help reveal fundamentals of physics. “I gave myself permission to think about underlying questions,” she says. 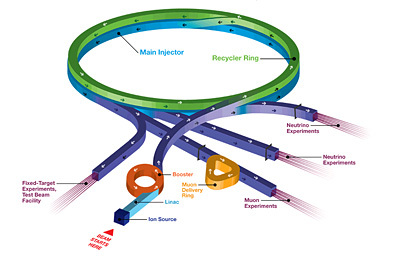 Inside the Fermilab particle accelerator, her instrument looked on as protons collided at near light-speed with their opposites—antiprotons—and the resulting particle shards decayed after the cataclysmic blast. By rewinding that action, physicists could dissect it in slow motion. From there, they could pick up its pieces, discover what matter is made of and the forces that hold it together, and pry it apart. Despite the foil-wrapped contraption’s messiness, those close observations of the femtoscale explosions are what helped her see she beauty. “A lot of us go into science partly driven by how beautiful the theories are,” Demers says. Physicists often describe their earliest experiences with the field as borderline spiritual, moments in which they realized that they—they!—can represent the world with math. 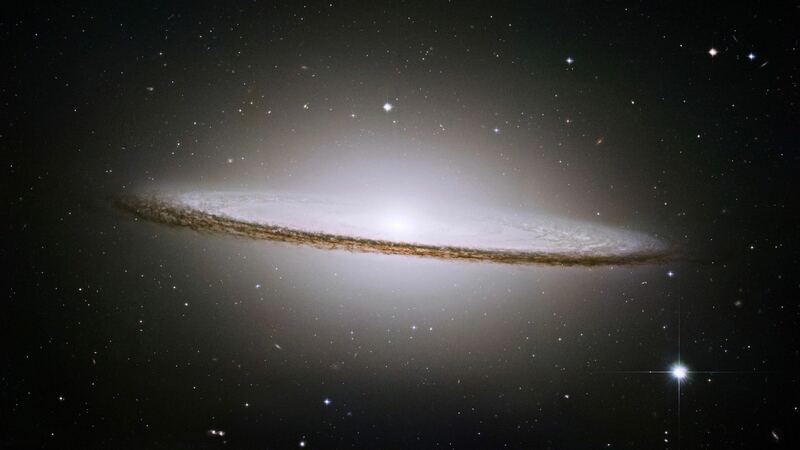 They can describe how stars shrink to black holes, how hard you will hit your head if you slip on a banana peel, and how protons fall apart inside particle accelerators. That ability gives them a sense of control in the way that describing something gives humans dominion over it. For many physicists, this fosters a desire to get to the very, very bottom of things: the theory of everything. Such a theory, many physicists often believe, should be beautiful, simple, elegant, aesthetically pleasing. All of the forces should fit under one umbrella; all particles need to emerge from a nested set of equations. No ifs, ands, buts, or loopholes. Physicists sometimes use these qualities, and their opposites—ugliness, caveats, asymmetries—as respective hot-and-cold indicators to guide them on the path toward understanding, describing, and conquering the universe. The current gold standard for describing the nature of reality, the Standard Model, isn’t physicists’ ideal because, among other blemishes, it isn’t perfectly symmetric, and the way it glues fundamental forces together is a little kludgy. That’s partially why scientists have developed a new idea, called supersymmetry, which smooths and extends the Standard Model, giving each of those old-school particles a new-school “supersymmetric” counterpart. Despite the fact that particle physicists have found no evidence of supersymmetry, they continue hunting for the elusive supersymmetric partners—partly because the theory is more aesthetically appealing than the Standard Model. But not all physicists believe that beauty should count as indirect evidence in favor of an idea. As Demers dug in to her research, she began to have doubts. Maybe it was okay for the universe to be a little bit ugly. And with that thought, Demers joined a faction of physicists who believe that the pursuit of beauty as truth may be leading the field of particle physics astray. The human desire for a fine-tuned, aesthetically pleasing cosmos goes much further back than our ability to build particle accelerators. Plato believed the universe was made of geometry: simple, pure shapes that some deus snapped together to form a Lego-like reality. A sufficiently smart person, he reasoned, could unsnap those building blocks to reveal the fundamental forms. Early astronomers also believed that planetary orbits were perfect circles. After all, in their view, God wouldn’t have doomed the planets to orbit along an imperfect path. Because every early astronomer started with this belief, it took Johannes Kepler six years to figure out that the evidence pointed to unappealing elliptical orbits instead. But when he allowed the experimental data to lead him toward a conclusion, he discovered a truth about the universe. After Kepler’s data-driven discovery, Isaac Newton created the theories of gravitational force that described how and why orbits actually trace ellipses, though his ideas again reached back toward aesthetic pleasure. The same gravity that makes apples fall onto our heads also makes Earth go around the Sun. One beautiful force to control them both. In this kind of thinking, Gleiser sees a different version of the ancients’ god-driven commitment to perfect circles. And in modern scientists’ pursuit of further unification—like making the physics of atoms and subatomic particles work with the classical physics that governs the everyday world—he sees a renewed religious impulse. “The idea that there is a force that describes everything is sort of a monotheistic cultural vice that we have,” he says. “Growing up in a culture for two or three thousand years where there is a god and a central command of things—I think that’s deeply ingrained in people’s heads.” In some sense, physicists have replaced their one true, symmetrically-faced God with one true, symmetric theory. For Demers and Gleiser, aesthetics as evidence loses its appeal when it is taken as…well…on par with evidence. For example, when the Large Hadron Collider failed to find any evidence of supersymmetry, many theorists tweaked their ideas about supersymmetry—saying, “Here’s why we don’t see any evidence”—rather than accepting that perhaps the evidence was pointing them elsewhere. Demers believes particle physics is in a data-rich era and that physicists should let data lead the way. As the Large Hadron Collider continues its run, it produces more and more evidence for experiments physicists like her to analyze—and then for theorists explain. “I think we may be more likely to win by the data just forcing us in a direction, as opposed to having some great idea that’s aesthetically motivated that pans out to be true,” she says. In other words, it isn’t a physicist’s job to write mathematical poetry expounding upon the platonic “universeness” of the universe. It’s their job to describe the physical reality that we interact with, that we have concrete experimental data about. And so, while beauty may be truth, the science of physics isn’t actually the pursuit of truth, nor the quest for beauty. 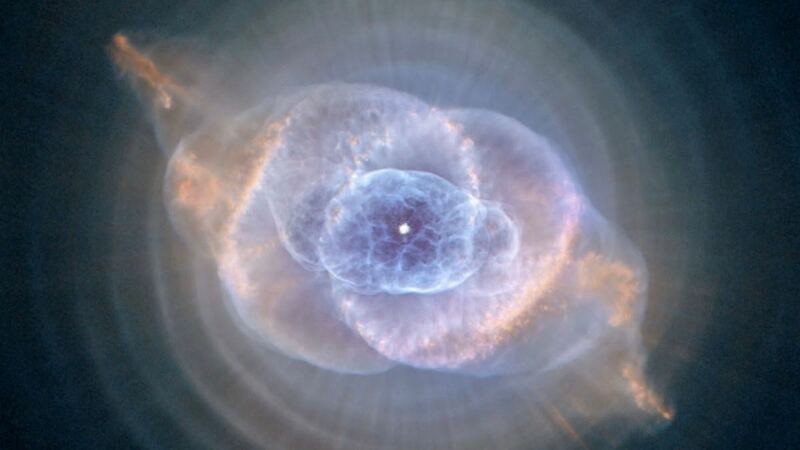 The universe may be, at its most fundamental, as perfectly balanced as a Shakespearean sonnet. But if the data from experiments suggests not a sonnet but a modern prose poem—which is no less pretty, just different, unconventional, and more complicated—it is still physicists’ duty as scientists to analyze it. In April 2015, after a two-year break for an upgrade, the Large Hadron Collider spooled back up. This summer, the accelerator—including the ATLAS experiment that Demers is part of—will conduct its second data-taking run at these higher energies with more particle collisions. By the end of the season, it will have recorded twice as much information as it did in all of 2015. In that data, says Demers, physicists should still search for evidence of the Standard Model and supersymmetry—she’s not opposed to those theories. But they should also go on “agnostic quests,” she says, where they don’t go looking for something in particular. Instead, they should just look, and see what they find. 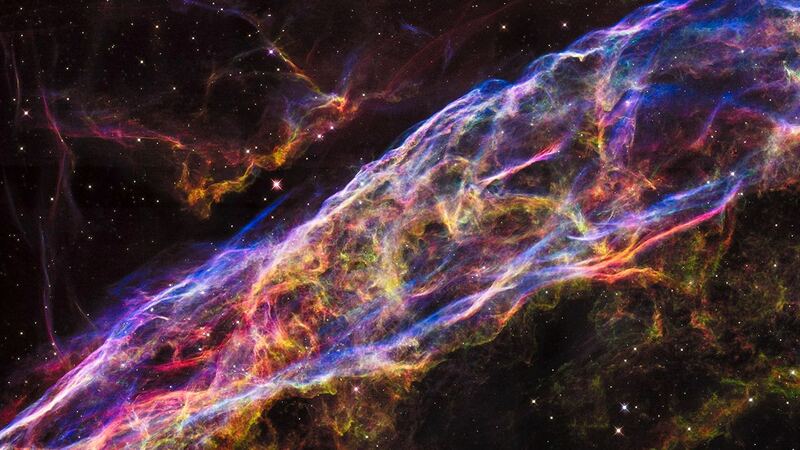 The Veil Nebula is the remains of a massive star that exploded 8,000 years ago. But some physicists may be reluctant to give up their beautiful theories, even if the data dictates they should. For example, while the Large Hadron Collider has so far failed to show evidence of supersymmetry, many have essentially said that the collision wasn’t powerful enough or that some small modifications are all that’s needed to fit the theory they love with the data they gathered. That may change in in ten years or so, he says, when further advances to the LHC could force the hangers-on to let go if the data they need doesn’t materialize. “If we don’t find evidence, people who still stick to it after that are doing it as a philosophical practice,” he says. Of course, it’s certainly possible that the answers to life, the universe, and everything will be elegant. To physicists like Demers and Gleiser, that’s not the problem: The problem is the a priori assumption that it is so. And if the foundational principles of the universe turn out to be ugly or tedious, perhaps we can find the beauty beneath the mess. In neuroscience, neurons get all the glory. Or rather, they used to. Researchers are beginning to discover the importance of something outside the neurons—a structure called the perineuronal net. This net might reveal how memories are stored and how various diseases ravage the brain. The realization of important roles for structures outside neurons serves as a reminder that the brain is a lot more complicated than we thought. Or, it’s exactly as complicated as neuroscientists thought it was 130 years ago. In 1882, Italian physician and scientist Camillo Golgi described a structure that enveloped cells in the brain in a thin layer. He later named it the pericellular net. His word choice was deliberate; he carefully avoided the word “neuron” since he was engaged in a battle with another neuroscience luminary, Santiago Ramón y Cajal, over whether the nervous system was a continuous meshwork of cells that were fused together—Golgi’s take—or a collection of discrete cells, called neurons—Ramón y Cajal’s view. Perineuronal nets, seen here stained red, wrap around neurons from a mouse’s brain. No image credit. Ramón y Cajal wasn’t having it. He argued Golgi was wrong about the existence of such a net, blaming the findings on Golgi’s eponymous staining technique, which, incidentally, is still used today. But it seems the focus on neurons has ignored crucial elements; neurons can’t explain everything about how the brain works, like how memories are stored or how various diseases ravage the brain. Now, neuroscientists are discovering that perineuronal nets may hold the secrets to some of the greatest mysteries of neuroscience. One thing perineronal nets might unlock are the workings of our memories. “Up to this point, we still don’t understand how we maintain memories in our brains for up to our entire lifetimes,” says Sakina Palida, a graduate student in Roger Tsien’s lab at the University of California, San Diego. Our current understanding is that memories are formed when the synapses—the spaces between two neurons—in our brain are reconfigured. As we learn, new synapses—new connections between neurons—are forged. If those connections are reinforced, proteins within the neurons are activated to boost the signal at that particular synapse, and what we’ve learned becomes committed to memory. But existing theories have a few loose ends. For one, the proteins responsible are replaced too quickly, on a scale of days to weeks. It’s difficult to imagine long-term memories being stored in such a system. Which brings us back, 130 years after it was first proposed, to the perineuronal net. The perineuronal net is an organized tangle of proteins that helps form the extracellular matrix, a sort of neuron exoskeleton. As our brain matures, from before birth through the teenage years, connections between neurons are refined; unnecessary connections wither away while other, more vital circuits are strengthened. The perineuronal net is the finishing touch: it surrounds neurons, establishing a physical barrier to prevent aberrant connections from forming while leaving holes in the armor to let existing synapses through. Tsien thinks that the structure of the net might be what’s holding our long-term memories. A hole in the net represents a memory: a stable, reinforced connection between two neurons. That the perineuronal net is involved in some form of memory isn’t entirely new; Tsien’s hypothesis is that it is the structure for long-term memory, and that is new. But first, Tsien and his collaborators had to prove that the nets are long lasting. To test this, Varda Levram-Ellisman, a scientist in Tsien’s lab, gave baby mice food containing nitrogen-15, a rare isotope, some of which would be incorporated into the animal’s developing brain structures. When the mice were six weeks old, after their perineuronal nets were fully developed, they were switched back to normal food. If the nitrogen-15 was still present months later, it would mean those structures had lasted that long. Indeed, nitrogen-15 was still a part of the perineuronal net after 180 days (the equivalent of years in human terms). The next step in developing the hypothesis was showing that the nets—and the holes within them—hold lasting memories. Palida likens making holes in the net to carving into stone. “Stone is a stable substrate. You retain the information regardless of what comes and goes over it as long as the substrate remains stable,” she says. Making new synapses requires certain enzymes to chisel through the net. When Levram-Ellisman gave mice a drug that inhibited one of these chiseling enzymes, the mice had poor long-term memory. Their short-term memory remained intact, however, suggesting drilling holes in the net was specific to long-lasting memories. In another experiment, Palida found that she could erode the nets in particular areas of the brain when she introduced a protein known to enhance memory. Palida has also developed new ways to visualize the nets, enabling her to detect them even when their composition varies. With these tools, she has discredited the thinking that the nets were specific to certain brain regions or cell types. “These nets are widespread throughout the brain. They surround all neurons,” she says. In 2009, perineuronal nets were blamed for the fact that fear memories are nearly impossible to erase in adults. In animal studies, fear memories are created by pairing a noise with a foot shock; mice learn to fear the noise since it means an impending jolt. In young mice, these memories can be completely wiped away by playing the noise over and over again without the foot shock; the mice relearn the noise is innocuous. But adult mice never really forget. Their memories can only be temporarily masked, they still crop up in triggering situations, like when put back in the cage that originally shocked them. The maturation of the perineuronal nets marks this transition between child and adult; when adult mice were given a drug that degraded the nets, they were able to completely forget their fear, in the same way young mice do. 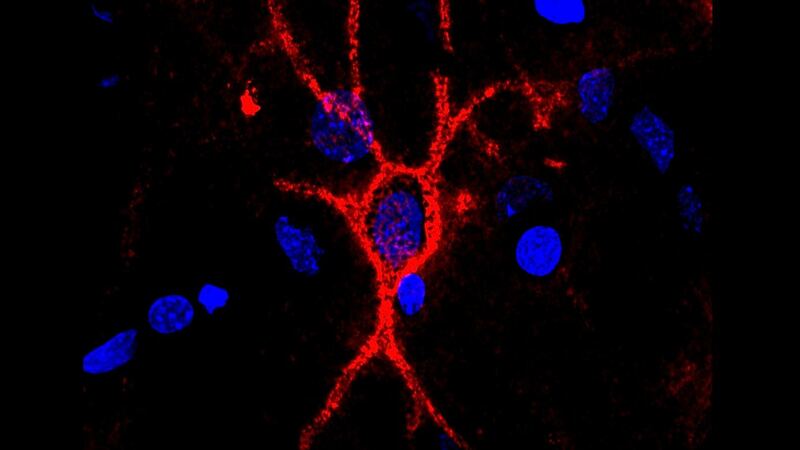 Understanding this process could help explain post-traumatic stress disorder—in which horrifying memories seem etched in stone—and provide a new target for treatment; perhaps degrading the nets could help release some of the unrelenting memories. The prevalence of perineuronal nets suggests that they could be the driving force behind not just long-term memories, but also certain neurological diseases. Sabina Berretta, an associate professor of psychiatry at Harvard Medical School, found that perineuronal nets are decreased in certain brain areas in schizophrenia. Additionally, several genes that have been implicated in schizophrenia code for molecules that make up the net or the enzymes that regulate it. Berretta found evidence that the nets are disrupted in bipolar disorder, too. There have been striking results in studies of Alzheimer’s disease, as well; postmortem studies of patients show fewer nets compared to controls. “Once we understand what may be the factors that contribute to these changes, then it may be possible to start understanding how to address them from a therapeutic point of view,” Berretta says. Perhaps paradoxically, given their role in long-term memory, recent work by Harry Pantazopoulos, a researcher in Berretta’s lab, has suggested that the nets might change over the course of the day. Although the total number of nets remains stable, in both mice and postmortem human brain tissue, the molecules within the nets seem to fluctuate in a rhythmic way; some of the nets’ components are increased during the day in certain brain regions, while others are increased at night. Berretta warns that the data is preliminary, but it suggests that these stable structures are also somehow dynamic. It may be that the composition changes to accommodate learning while we are awake and consolidation of memories while we are asleep. At the latest Society for Neuroscience meeting in Chicago, it was clear perineuronal nets are not being ignored any longer. “They’re everywhere at this meeting,” says Angela O’Connor, a researcher at the University of Michigan who studies how the nets change when mice are put in stimulating environments. 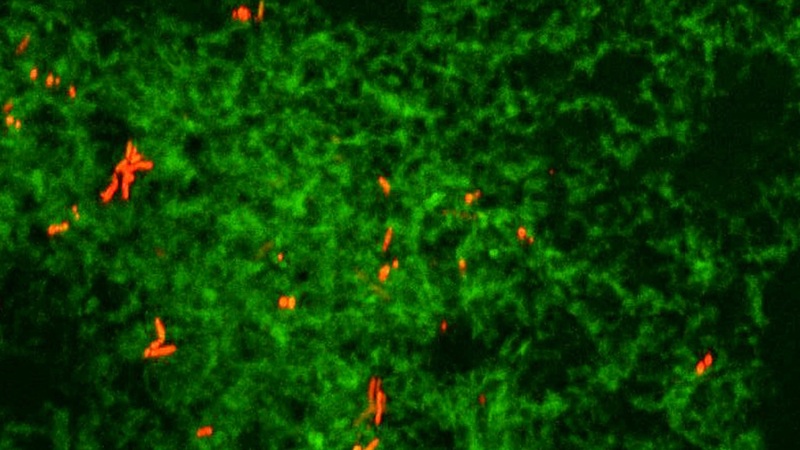 Since they were overlooked for so long, perineuronal nets and the extracellular matrix might explain many of neuroscience’s mysteries, from how memories are stored for decades to how certain diseases disrupt the brain. Berretta suspects that there are other, similarly critical components of the extracellular matrix that have been ignored for too long as well. “It is possible from a pathological point of view that we haven’t even begun to understand the extent of these changes not only in schizophrenia, but also their involvement in other brain disorders,” Berretta says. “The nets were reported a long time ago by Camillo Golgi. They were drawn, they were described. We simply didn’t know what to do with them, so we kind of ignored them,” she says with a laugh. Those days appear to be over. Embedded in a small translucent wafer measuring just under an inch a side, the spiraling coils—like neatly packed iPod earbuds—aren’t much to look at. But judging on appearance alone would sell short the brainchild of Chwee Teck Lim of National University Singapore and Jongyoon Han of the Massachusetts Institute of Technology. Those coils sift through millions upon millions of blood cells for faintly detectable indicators of a solid tumor lurking in a patient’s body—the handful of cancer cells that are often found circulating in the blood. Called circulating tumor cells, these cells may well be the seeds of distant metastases, which are responsible for 90% of all cancer deaths. Over the past several years, researchers and clinicians have become increasingly fixated on these circulating cells as cellular canaries-in-the-coalmine, indicators of distant disease. The blood of cancer patients is chock-full of potentially telling molecules, and researchers and clinicians are hotly investigating these materials for their efficacy as indicators and predictors of illness, disease progression, response to treatment, and even relapse. 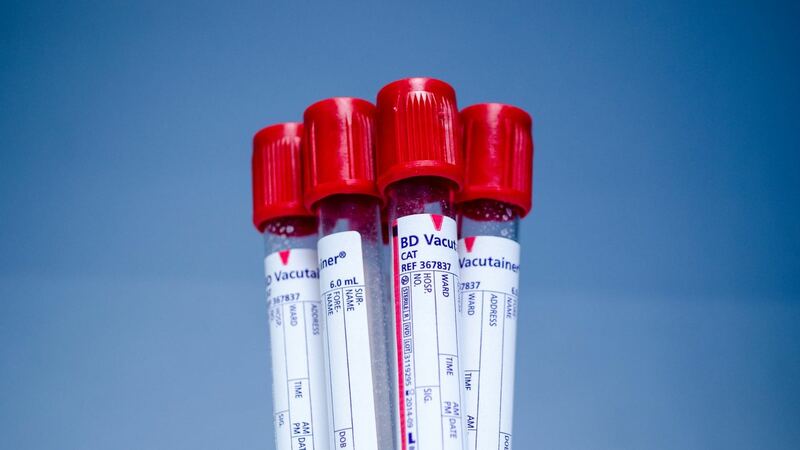 Soon, a simple blood test could reveal whether a person has cancer. For patients with cancer, such tests could provide a welcome respite from painful, invasive, and sometimes dangerous biopsies that typically are used to track and diagnose disease—a fact reflected in the terminology often used to describe the new assays: liquid biopsy. For researchers and clinicians, they provide a noninvasive and repeatable way to monitor how a disease changes over time, even in cases when the tumor itself is inaccessible. And unlike the finger-stick testing used by the embattled company Theranos, which recently voided two years of results from their proprietary blood-testing machines, the liquid biopsy methods being researched and developed by teams of scientists around the world use standard blood-drawing techniques and have been subject to peer review. In the short term, researchers hope to use liquid biopsies to monitor tumor relapse, track a tumor’s response to targeted therapies, and match patients with the treatments most likely to be effective—the very essence of “personalized medicine.” But longer term, some envision tapping the blood for early diagnosis to catch tumors long before symptoms start, the time when they’re most responsive to treatment. Despite its name, liquid biopsies are not exactly an alternative to solid tissue biopsies, says Mehmet Toner, a professor of biomedical engineering at MGH who studies circulating tumor cells. Patients who are first diagnosed with cancer via a liquid biopsy would likely still undergo a tissue biopsy, both in order to confirm a diagnosis and to guide treatment. But liquid biopsies do provide molecular intel that might otherwise be impossible to obtain—for instance, in the treatment of metastatic disease. Oncologists typically biopsy patients with metastatic disease only once, to confirm the diagnosis, says Keith Flaherty, director of the Henri and Belinda Termeer Center for Targeted Therapies at the MGH Cancer Center. But such a test reveals the genetics of the cancer only at the sampled site. Many patients harbor multiple metastases, some in relatively inaccessible locations like the lungs, brain, or bones, and each may contain cells with different genetic signatures and drug susceptibilities. “Liquid biopsies provide an aggregate assessment of a cancer population,” he says. Today, says Max Diehn, an assistant professor of radiation oncology at the Stanford University School of Medicine, oncologists can get a read on how a patient responds to therapy using a handful of protein biomarkers found in blood, urine, or other biofluids, such as prostate-specific antigen (PSA) in the case of prostate cancer, or using noninvasive imaging technologies like magnetic resonance imaging (MRI) or computed tomography (CT). But those tests often fall short. Many biomarkers aren’t specific enough to be useful, and imaging is relatively expensive and insensitive. Also, not everything that appears to be a tumor on a scan actually is. And, Flaherty notes, imaging studies reveal little or no molecular information about the tumor itself, information that’s useful in guiding the treatment. In contrast, liquid biopsies can reveal not only whether patients are responding to treatment, but also catch game-changing genetic alterations in real time. In one recent study, Nicholas Turner of the Institute for Cancer Research in London and his colleagues examined cell-free tumor DNA (ctDNA), or tumor DNA that’s floating free in the bloodstream, in women with metastatic breast cancer. They were looking for for the presence of mutations in the estrogen receptor gene, ESR1. Breast cancer patients previously treated with so-called aromatase inhibitors often develop ESR1 mutations that render their tumors resistant to two potential treatments, hormonal therapies that target the estrogen receptor and further use of aromatase inhibitors that block the production of estrogen. Turner’s team detected ESR1 mutant ctDNA in 18 of 171 women tested (10.5%), and those women’s tumors tended to progress more rapidly when treated with aromatase inhibitors than did women who lacked such mutations. Those findings had no impact on the patients in the study—the women were analyzed retrospectively—but they suggest that prospective use of ctDNA analysis might be used to shift treatment toward different therapeutic strategies. Viktor Adalsteinsson of the Broad Institute of MIT and Harvard, whose group has sequenced more than a thousand liquid biopsy genomes, calls the ESR1 study “promising and illuminating.” At the moment, he says, such data are not being actively used to influence patient treatment, at least not in the Boston area. But Jesse Boehm, associate director of the Broad Cancer Program, says he thinks it could take as little as two years for that to change. “I’ve been here at the Broad for ten years, and I don’t think I’ve ever seen another project grow from scientific concept to potentially game-changing so quickly,” he says. Liquid biopsies generally come in one of three forms. One, ctDNA—Adalsteinsson’s material of choice—is the easiest to study, but also the most limited as it relies on probing short snippets of DNA in the bloodstream for a collection of known mutations. The blood is full of DNA, as all cells jettison their nuclear material when they die, so researchers must identify those fragments that are specifically diagnostic of disease. While the genetic mutations behind some prominent cancers have been identified, many more have not. Also, not all genetic changes are revealed in the DNA itself, says Klaus Pantel, director of the Institute of Tumor Biology at the University Medical Center Hamburg-Eppendorf. A second class of liquid biopsy focuses on tiny membrane-encapsulated packages of RNA and protein called exosomes. Exosomes provide researchers a glimpse of cancer cells’ gene expression patterns, meaning they can reveal differences that are invisible at the DNA level. But, because both normal and cancerous cells release exosomes, the trick, as with ctDNA, is to isolate and characterize those few particles that stem from the tumor itself. The third counts circulating tumor cells, or CTCs. They are not found in healthy individuals, but neither are they prevalent even in very advanced cases, accounting for perhaps one to 100 per billion blood cells, according to Lim. Researchers can simply count the cells, as CTC abundances tend to scale with prognosis. But there’s much more that CTCs can do, Pantel says. “You can analyze the DNA, the RNA, and the protein, and you can put the cells in culture, so you can get some information on responsiveness to drugs.” Stefanie Jeffrey, a professor of surgery at Stanford University School of Medicine, has purified CTCs and demonstrated that individual breast cancer CTCs express different genes than the immortalized breast cancer cells typically used in drug development. That, she says, “raises questions” about the way potential drugs are currently evaluated in the early stages of development. Similarly, Toner and Haber have developed a device called the CTC-iChip to count and enrich CTCs from whole blood. The size of a CD—indeed, the chips are fabricated using high-throughput CD manufacturing technology—these devices take whole blood, filter out the red cells, platelets, and white blood cells, and keep what’s left, including CTCs. The team has used this device to evaluate hundreds of individual CTCs from breast, pancreatic, and prostate tumor patients to identify possible ways to selectively kill those cells. Elsewhere, Caroline Dive, a researcher at the University of Manchester, has even injected CTCs isolated from patients with small-cell lung cancer into mice. The resulting tumors exhibit the same drug sensitivities as the starting human tumors, providing a platform that could be used to better identify treatment options. According to Lim, liquid biopsies have five potential applications: early disease detection, cancer staging, treatment monitoring, personalized treatment, and post-cancer surveillance. Of those, most agree, the likely near-term applications are personalized treatment and treatment monitoring. The most difficult is early detection. In another study, Nickolas Papadopoulos, a professor of oncology and pathology at the Johns Hopkins School of Medicine, and his colleagues surveyed the ctDNA content of 185 individuals across 15 different types of advanced cancer. For some tumor types, including bladder, colorectal, and ovarian, they found ctDNA in every patient tested; other tumors, such as glioblastomas, were more difficult to pick up. “It made sense,” Papadopoulos says. “These tumors are beyond the blood-brain barrier…and they do not shed DNA into the circulation.” In later studies, the team demonstrated that some tumors are more easily found in bodily fluids other than blood. Certain head and neck cancers are readily detected in saliva, for example, and some urogenital cancers can be detected in urine. But in their initial survey, Papadopoulos and his colleagues also tested blood plasma for the ability to detect localized (that is, non-metastatic) tumors, identifying disease in between about half and three-fourths of individuals. In the meantime, researchers are focusing on personalized therapy. Alizadeh and Diehn, for instance, have tested patients with stage IV metastatic non-small cell lung cancer, a grave diagnosis, who had been taking erlotinib, a drug that targets specific mutations in the EGFR gene. Over time, all patients develop resistance to these drugs, half of them via a new mutation, Diehn says. Diehn and Alizadeh have begun looking for that mutation in the ctDNA of patients whose disease progresses, or returns, as such tumors can be specifically targeted by a new drug, osimertinib. “It’s been shown in a couple of studies that such patients then have a good response rate,” Diehn says, with the median “progression-free survival” doubling from about ten months to 20. Most scientists working on liquid biopsies agree that the technology itself is mature. What’s needed to make a difference in patients’ lives is clinical evidence of sensitivity, selectivity, and efficacy. Fortunately, they’re working on it. According to the National Institutes of Health’s clinical trials database, clinicaltrials.gov, over 350 trials are currently studying the use of liquid biopsies in cancer detection, identification, or treatment. One recent trial, published in April in JAMA Oncology, examined the ability of ctDNA analysis to detect key mutations in two genes associated with treatment decision, response, and resistance in non-small cell lung cancer. The 180-patient prospective trial determined that the method used could detect the majority (64% –86%) of the tested mutations with no false-positive readings in most cases. Results were returned on average within three days, compared to 12 to 27 days for solid-tissue biopsy. The technique is ready for clinical use, the authors concluded. In an ongoing trial, Pantel and his colleagues are focusing on a breast cancer-associated protein called HER2. Several anticancer therapies specifically target HER2-positive tumors, including trastuzumab and lapatinib. The trial is looking for instances of HER2-expressing CTCs in patients with metastatic breast cancer whose original tumor did not express HER2. About 20% of HER2-negative tumors meet that criterion, Pantel says, but before liquid biopsies became an option, there was really no way to find them. Now, his team is testing “whether the change to HER2-positive CTCs is a good predictor for response to HER2-targeted therapy.” If it is, it could unlock potential treatments for patients. In another trial, Flaherty, the center director at MGH, and his colleagues are using a series of liquid biopsies in several hundred patients with metastatic melanoma to determine if they could retrospectively predict drug resistance by monitoring for mutations in a particular gene. In the meantime, diagnostics firms are developing assays of their own. Currently, there is only one FDA-approved liquid biopsy test on the market in the United States. But there also are a growing handful of lab-developed assays for specific genetic mutations available and several more in development. Early cancer screening is farther out, and while many researchers still express skepticism, the application received a high-profile boost in January when sequencing firm Illumina announced it was launching a spinoff company called Grail. The company, which has already raised some $100 million in funding, will leverage “very deep sequencing” to identify rare ctDNA mutations, and plans to launch a “pan-cancer” screening test by 2019. Only time will tell, though, whether Grail or any other company is able to fundamentally alter how patients are treated for cancer. But one thing is certain, Flaherty says: Genetic testing, however it is done, only addresses the diagnostics side of the personalized medicine challenge; progress is also required on the drug development side. After all, what good is a test if there’s no way to act on it?